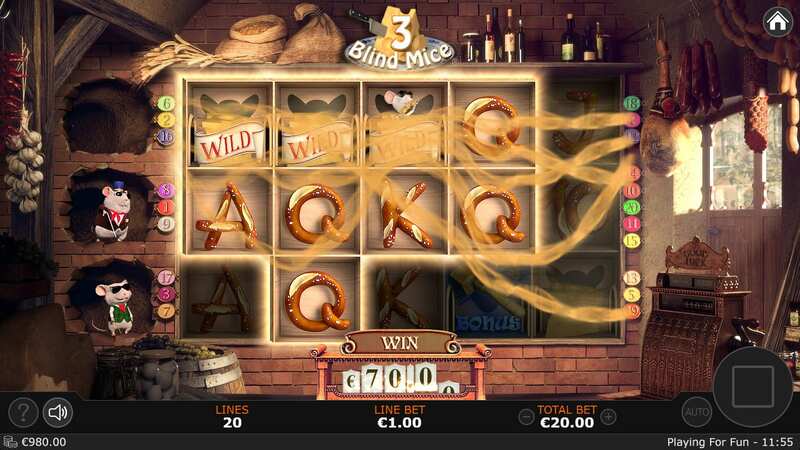 It’s time to wake up and smell the cheese with 3 Blind Mice, another thrilling video slot game from online casino innovators Sunfox Games! Drawing inspiration from the famous children’s nursery rhyme, follow the eponymous visually-challenged mice as they run riot in the farmer’s kitchen and dodge the farmer’s wife. In this brilliant reimagining of a timeless ditty, help the 3 Blind Mice nab all the cheese that their hearts’ desire before the lights come on and their destruction is revealed! An enthralling experience whether you’re a beginner or expert, deposit today and get ready to be the big cheese! For more slot games from Sunfox Games, head to Wizard. Whether its dipping their tails in a scrumptious jam, nibbling through the finest ham or taking a bite out of some delicious gingerbread, these mischievous mice certainly have high standards when it comes to gastronomic delights! 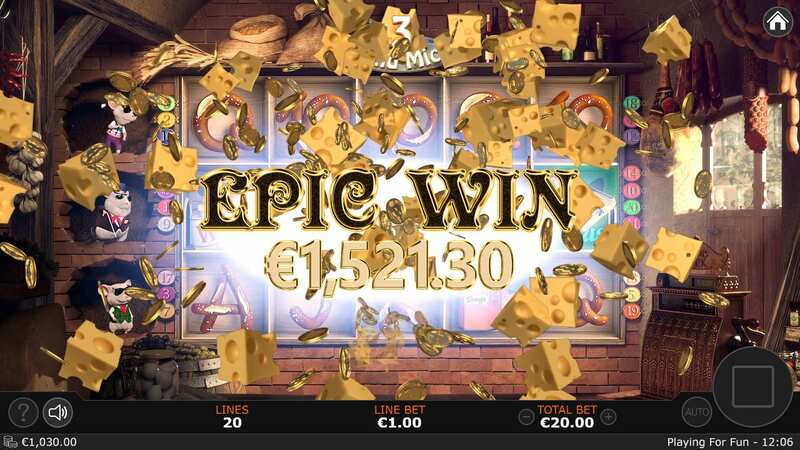 And with 20 paylines, big cheese bonus and 500x multipliers you can enjoy some of the finest video slot fun around with 3 Blind Mice. Line up the Cheese Wild symbols for bonuses and snare the ham and orange jam for even more chances to win! DODGE THE FARMER’S WIFE – Land the Farmer’s Wife Wild Bonus symbol on reel 3 to boost your chances of forming a winning payline thanks to the expanding Wild. But spare a thought for the poor farmer’s wife and her demolished pantry! BE THE BIG CHEESE – Enjoy double the fun with the interactive Whack-A-Mouse and Big Cheese Trail bonus games. Use your hammer to whack mice for cash prizes or see how far you can go on the Big Cheese Trail with a few rolls of the dice. HILARIOUS ANIMATIONS – It doesn’t matter if you claim a big chunk or a small nibble of the jackpot, the slot game’s charming animations are guaranteed to have you grinning! Who knew that 3 Blind Mice could cause so much chaos and unlock such great cash prizes to boot? With three columns and five rows, it will be difficult for you not to crack a smile at the antics of the errant blind mice as they nibble their way through the farmer’s larder and help you claim big bonuses in the process! The charming graphics, music, and animations all help to bring the centuries’ old heritage of this children’s classic to life, while the many ways to win will keep you coming back for more. Another cracker from Sunfox Games! Wizard Slots also recommends that you try Apollo: God Of Sun!